Sometimes saucers used to make me pretty angry too. omgomgomgomgomgogmgomosdmgomdomgalgmksldfksdfhsklfhsas. I'm going to see Michael Bublé live in August. . I had an excellent fourth of July (hope you all did as well), and I did a lot of fun things. I saw many movies, including War of the Worlds, Rize and others. War of the Worlds was pretty cool. It kept my attention and was really well done, albeit confusing at times, since I haven't read the story or seen the original. Very nice overall. Rize, a documentary by David LaChapelle (the artist I did my photography project on) about a style of dance in the ghetto areas of L.A., was superb. It was visually stunning (COLORCOLORYAY) and really interesting. And the speed at which those guys can dance is...incredible. I definitely suggest seeing this movie. And another omg thing. I saw that old British show The Young Ones for the first time ever and I LOVE IT LOTS. Anyone else on the f'list a fan? I know lallyloo is, but anyone else? God, my brain is weird. Don't worry, it's not a major one. I have the mild ones all the time, many of which I don't mention at all. I love the Young Ones!!! And Vyvyan is my favorite too. 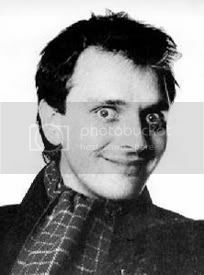 But Rick Mayall (sp?) is kinda a cutie. I used to have a Young Ones icon, dammit....what did I do with that? Yay, another fan! Hee, Vyvyan is hilarious. ISN'T IT EXCITING?? I'm so haaaapppyy!! Did you see the episode where Terry Jones makes an appearance? :D And what could be more cool but see Madness appear twice. I really love the show. Did you see them on BBC America? I finally have that channel and could finally see them, alongside the support for Monty Python. Yesyesyesyes. Of course, my wife MUST like The Young Ones. There is no other way. I've seen all the episodes! I bought the DVDs. I know, I loved Madness' performances! It made me happy inside. I first saw them on BBC America, late one night, by accident. And it hooked me in and wouldn't let go ARGH DEMONS.